Rotation, mirroring and inversion are noncommutative and hence non Abelian transformation operations in set theory. The result depends on the sequence of operations. The simulation demonstrates this for the operations of rotation and mirroring, applied to a triangle. The slider Base Orientation defines the orientation of the original triangle. One observes the counterclockwise rotation of the mirror image, which is the same in both charts. The slider Rotation Angle creates a rotation operation on the object in its base orientation. In the left chart the rotation is operated on the object A, and the mirror image M of the rotated object R is displayed. In the right chart the rotation is operated on the mirrored object M and results in a different R. The sequence of operations is discernable by the coloring of the triangles: green is first, blue is second. The left chart displays the mirrored-rotated object, the right one the rotated-mirrored object. In general both are different in orientation. The transformation operations are noncommutative. Reset restores the initial orientation. If you first apply a rotation to a object, then mirror that rotated object, you'll find that what you get is different than if you first applied the mirroring, then the rotation. There are two panels in this simulation: the left panel shows what happens when you first apply rotation, then the mirroring. the right panel shows what happens when the mirroring is first applied, then the rotation. 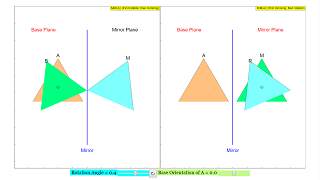 The rotation and base orientation of the triangle A can be adjusted using the sliders provided.